My piece started out as a photograph of an island fruit-scape made of bananas, kiwis and tiny oranges. Having spent a few years on a tropical island and remembering the abundance of fresh fruit, this seemed like the perfect inspiration. Of course, I also wanted a way to bring technology into the final project so I took the photo into a kaleidoscope software program and manipulated it until I had something pleasing. The final selections were printed onto printer fabric. The smaller version was cut and portions added to the corners. 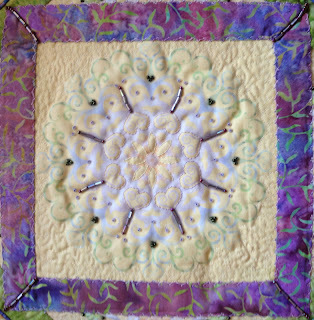 The quilt was then embellished with hand stitching using silk thread, beading, decorative machine stitching, as well as micro stippling. The darker beads in the corner blocks represent the kiwi seeds in the original photograph. The border and binding fabrics are meant to mimic the flora, water and sand of a tropical island. 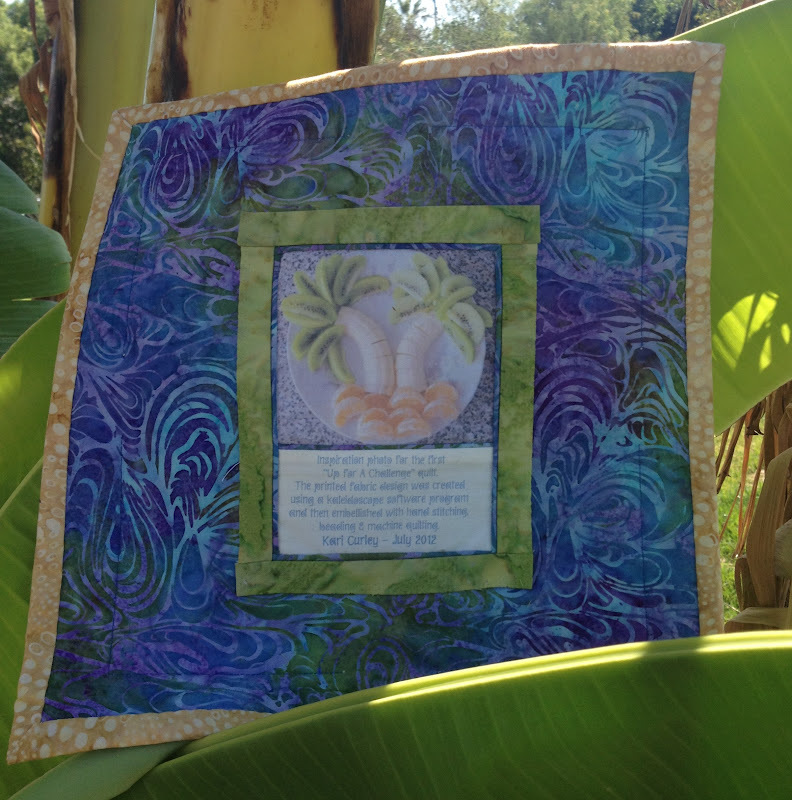 The inspiration photo became a part of the quilt label on the back of the piece. I’m also from Patti Maderis Culea’s Stargaze Tome group and Gladys and I were in one of Patti’s challenge groups together last year. 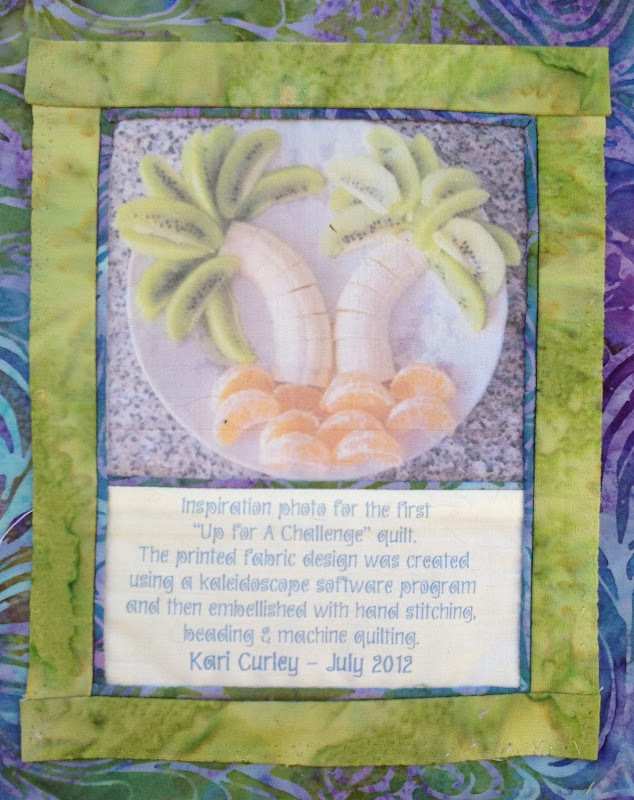 I was honored that Gladys asked me to join this 12x12 challenge group. I don’t have a blog…yet, maybe someday. Instead, I’m kept busy by the 9 Yahoo! Groups I own. 8 of these are for the Bernina line of products which I also teach independently. The final group is technology based, a subject near and dear to my heart; I’m a geek! I live in southern California with my husband of 31 years, 2 of our 3 kids and assorted cats, large dogs and an ancient tortoise. I love to sew, both by machine and by hand and if I can incorporate technology into a piece so much the better! I'm sorry, I didn't mean to scare you all with this word. I have looked in a couple of dictionaries and they tend to stay with the literal modern use of the word applied to things electrical.I first remember it as the name of the gas mantles that used to light my grandmother's house - 'incandescent globes'. Wickipedia describes its figurative use as describing a person who is very angry, but I was thinking of the scene in 'Becoming Jane' when she says her writing is going to be incandescent. 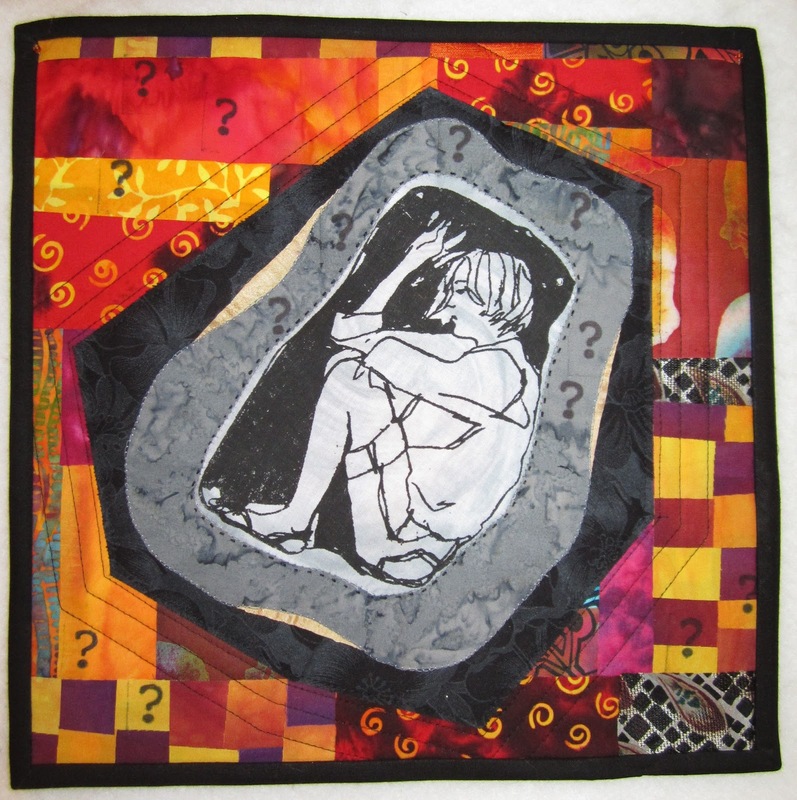 I would say that the work of textile artists is often incandescent with creativity. Btw, I have had to start a new post because I cannot work out how to get my computer to accept a reply to a post - any suggestions as to what I am doing wrong or not doing? Love and hugs, Maudie/Barbara in Cornwall where it is still raining, but the ferns and foxgloves in the hedgegrows are looking magnificent. I pondered whether I was up for the challenge with this group but I will give it a try. After all it is to make you try new things and generally muck along, which is what I like to do. The theme brought all the images that this wonderful island I live on and its neighbouring favorite cousins have to offer. 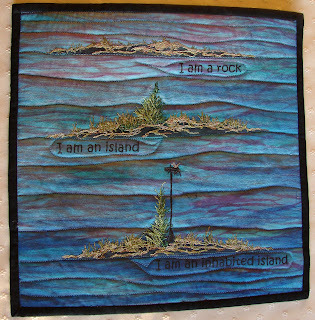 I thought too of the islands I have visited but I just kept on humming --- I am a rock -- I am an Island --- now get that out of your head. Shows my generation and time warp. In the end the funny little island in the Thousand Islands took up residence. I titled this piece " Island Status" because evidently you are an island when you have one tree. It brings good memories of a fun afternoon taking mom on a cruise in the St Lawrence Seaway. We chuckled about the status definition but fiqured they had to get to a thousand so what the heck. Notice how these islands become personalities ---anyone else have this problem or should I be looking at "alternate residences " sooner? I began by resurrecting a failed piece of shibori with some shimmer fabric paint. Thought it might need a little glitz since I'm really not a bling person. I quite like the results. 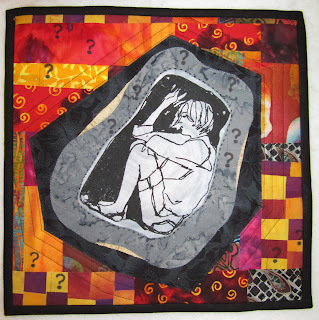 The objective was to explore the possibilites with Transfer Artist Paper ( can easily be ironed onto fabric paint) to see about using an image to thread paint part of and to solve a problem with mirror imaging text to do this. I guess I like messing with my brain but problems were solved in a convoluted kind of way. 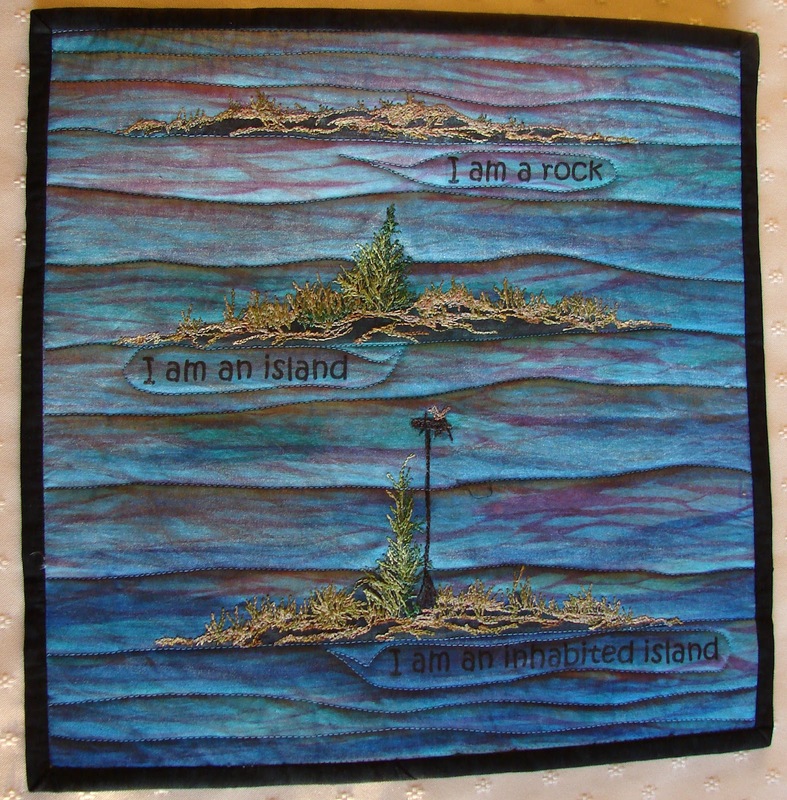 It is a fun little memory quilt and show that each island is unique whether it has a castle or a bird box. In the end I got my mind into it, as the business year end stuff was hibernating until August and I had a chance to play. I am on holiday to play for the next month. Dye studio is set up outdoors and the days are warm. I know I haven't yet posted my first 12x12, but I did explain to Gladys that I was heavily committed until the beginning of July. Promise I will produce an Island square. Hope you are all instantly inspired. Love and hugs, Maudie in a very damp Cornwall. The year 2009 was a very special one in my life. The publishing of my first book, followed by a trip to Pittsburgh, Pennsylvania for spring quilt market, and that followed up by meeting two very good friends in New York City for 5 days. An absolutely fabulous time that left an indelible memory and set the bar very high for anything to match it! When the theme "Island" was chosen, and it wasn't my first choice....we can thank Joan for this one, I had so many ideas that I didn't know where to start. Joan knows.....she heard about all of my ideas....seagulls on logs, grandmas with babies in their lap, etc. Procrastination being one of my stronger character faults.....I thought and thought, but there was no action. It was an easy theme for someone who lives on an island (Vancouver Island), and especially when that someone knows people who live on even more remote islands which she gets to visit regularly! There were also the predictable "No Man is an Island" phrase....and you should have seen the man I was going to create....but I digress! I was pondering between three of what I thought were really good ideas when one of the friends I met in Manhattan and I went for a long beach walk here at home. She wiggled her eyebrows and said "Manhattan is an Island"......and smirked. That was it. I loved the idea. So here it is. This is a collage/improvisationally pieced/bead embellished/thread painted and quilted representation of some of my favorite things in New York City. There are so many more! But I chose these from my photographs, printed them on fabric, pieced them into pieces of sari silk (yes I shopped where Joan did), clothing, hand dyed fabric, lame and best of all, some words (Manhattan, Times Square, Grand Central & Broadway) are from commercial fabrics purchased at City Quilter in NYC! I love to embellish my work, and in this project I worked with individual sequins and learned how to lay them out in a line. Not my favorite enterprise, but they seemed just right to represent the marquee lights. I used some square sequins that are meant to represent windows on the NASDAQ building, and trimmed them to varying sizes to fit with the shape of the building in my photo. I have more embellishing to do, but this could go on forever so I thought I better just post it as it's close! 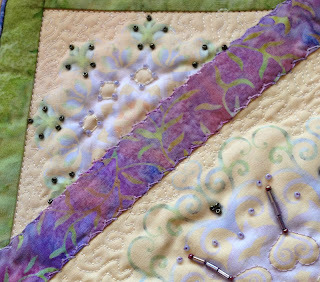 I want to add some thread painting and a few more beads. I took a photo of Bwama Island, an Island in Lake Bunyoni, Uganda a few years ago with the idea that I would someday make a quilt to remind me of a visit to Bushara Island. I also took 2 classes with Sue Benner, one on abstraction and the other about landscapes. I love the way she uses strips, and decided I would try her method. I love the result, and am anxious to make more using the same technique. 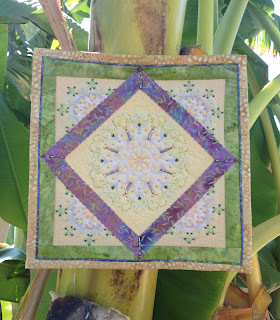 The strips I used are sari silk purchases at the Back Porch quilt store in Pacific Grove, California. They come in a variety of colors and designs and are twisted up into a skein, much like yarn. Obviously my someday is here! This exercise stretched me somewhat, and I am anxious to do more. 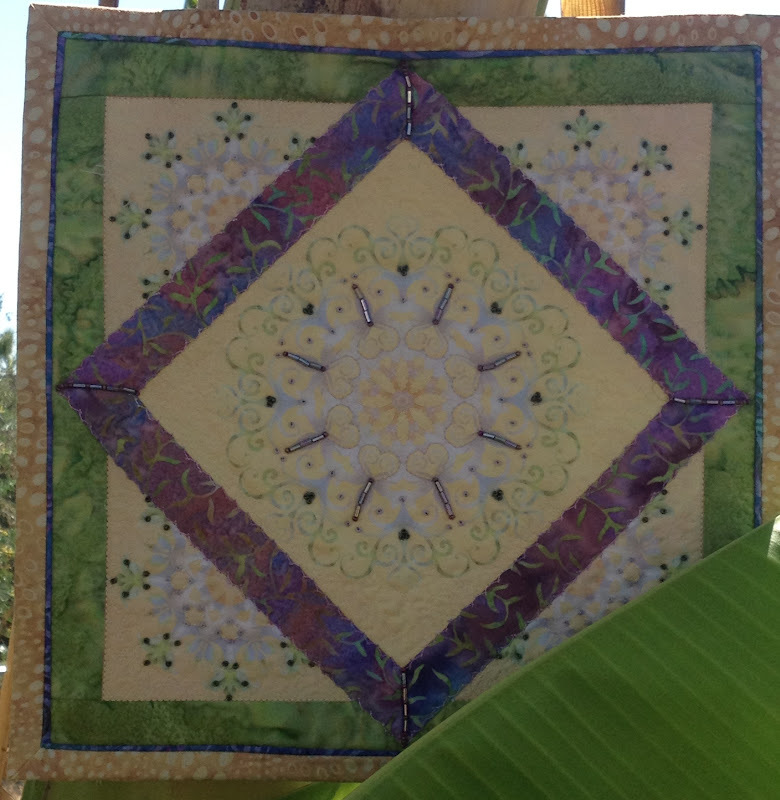 This is the full size 12 x 12 picture of Bwama Island challenge quilt. Actually, it is terraced fields given by the local Diocese to women who are able to till the land and feed their families with the produce. I used raw edge strips, laid out to represent the terraces as they rise out of Lake Bunyoni. I have folded some pieces to create abstract plants and thread painting to make the reeds in the lake. OK Barbara, what's the next challenge theme? Gladys is sitting beside me as I do this because I am technologically challenged, and she promises to have hers posted today as well, and when she does, she'll start nagging! My piece is called "Choices". When I first heard what the first challenge theme was, I thought about working with a map of Hornby Island. The latter is my "happy place", and I have been thinking about playing with the altitudinal lines for sometime. 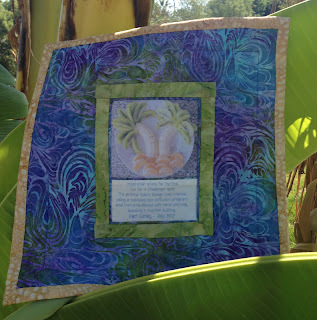 But then I thought about my commitment to myself to work with Africa-inspired textiles and themes, and wondered about making a landscape quilt, looking out at the island across the way from Bushara Island in Uganda. But I knew that Joan was going to do that, so I asked myself what I would do if I just let myself be free and do whatever I wanted. Well . . . there is this image of a young woman - troubled, thoughtful - that I have had since I was in my teens. It represents a time that was very difficult for me. 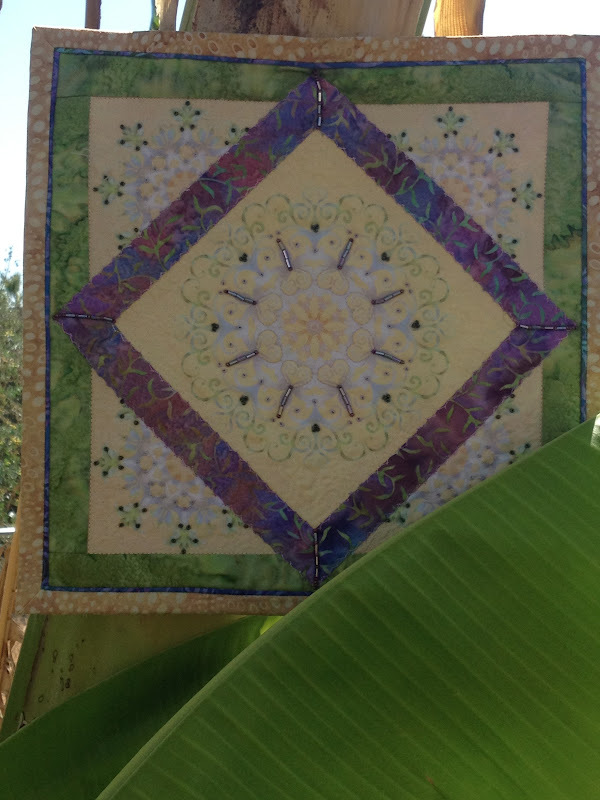 I screen-printed it onto a variety of grey fabrics, and chose one of them for the focal point in this quilt. I though about the saying "No man is an island", but the truth is that sometimes you can feel very much alone, very much an island, and that's what I wanted to work with. In the end, it is your own choices and your own life that you are responsible for - no-one else's. So the screen-printed girl became an island. Life is happily carrying on all around her, but she is left to make a choice, a decision, on her own. I so look forward to seeing all the other challenges. Any chance we'll be able to see them all together at some point, Gladys? Sort of like the Twelve by Twelve group? That would be wonderful.